You’re most likely familiar with the negative health consequences associated with undercooking your food, such as the intake of harmful bacteria such as E. coli, salmonella, and staphylococcal infections, particularly with respect to animal products such as meat, poultry and fish, but few people have ever considered the risks associated with overcooking your food. Many people would be surprised to find that, in fact, nutritional experts have urged caution with regard to overcooked foods, suggesting that they may actually increase our risk of developing cancer, and that people may even be losing vital nutrients when their foods are overcooked. 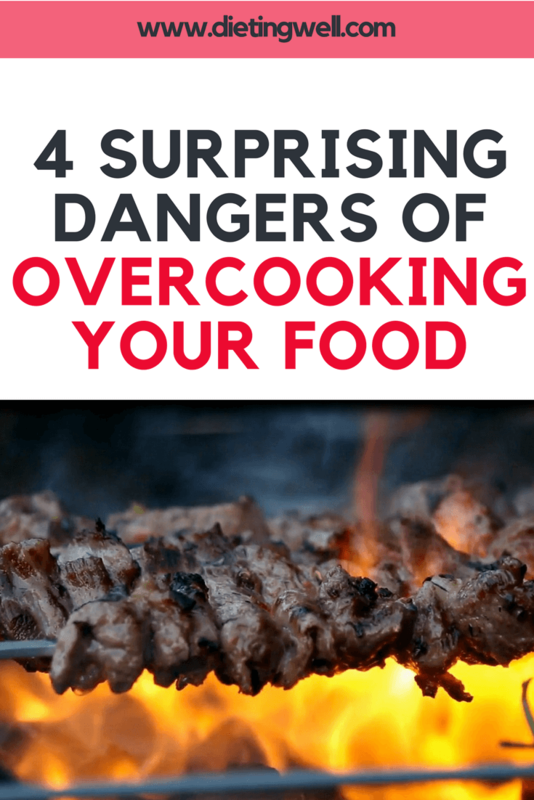 Keep reading to find four major reasons why you should be more cautious about eating overcooked foods. In a landmark study published in 1930, researchers from the Institute of Clinical Chemistry in Zurich, Switzerland made a number of key discoveries concerning the ways in which cooking food over a certain minimum temperature affects the biochemical content of the blood. The researchers found that processed and overcooked foods both resulted in a marked increase in the concentration of white blood cells, whereas the consumption of lightly cooked or unprocessed foods had no effect on white blood cell count. This increase in white blood cells is referred to as digestive leukocytosis. This condition reflects the same stress response induced by the body in reaction to infections and inflammation. The scientists found that the greater the degree of overcooking, the greater the increase in white blood cell concentration. The research indicates that the body has a far more difficult time digesting overcooked food compared to raw or lightly cooked foods. The longer food is cooked, particularly at high temperatures, the longer it remains in the gut, as the digestive tract takes longer to break down and absorb nutrients at the cellular level. Foods cooked at high temperatures over long periods of time, especially meat products, release chemicals known as heterocyclic amines (HCAs) and polycyclic aromatic hydrocarbons (PAHs) which have well established carcinogenic properties. Meats that are charred or exposed to smoke during the cooking process contain especially high concentrations of HCAs and PAHs. Scientific research has established a strong correlation between overcooked meats and numerous forms of cancer. Clinical trials on animals fed with food containing high concentrations of HCA quickly developed tumors of the skin, lung, breast, prostate, and liver. Experts have strongly advised against exposing meat to an open flame, and caution that cooking meats at high temperature for prolonged periods should be avoided. Studies have also found that foods that are high in starch, such as toast and french fries, develop a carcinogenic compound known as acrylamide when cooked for too long. Acrylamide has only been found to develop in foods heated to temperatures over 120 degrees Celsius (248 degrees Fahrenheit), and concentrations of this harmful chemical have been found to increase the longer foods are kept at high temperatures. The World Health Organization has expressed “major concern” over the risk of acrylamide consumption. Studies have shown a strong correlation between levels of dietary acrylamide intake and several types of cancer, including cancers of the breast, kidney, and esophagus. Some vitamins are highly temperature sensitive. In particular, the vitamins thiamine, niacin, and folate can be destroyed due to overexposure to heat. This means that periods of prolonged overcooking result in steadily depleted amounts of vitamins in food. This is especially true with respect to green vegetables. Health experts strongly suggest that green vegetable should be cooked as little as possible so as to retain all of their nutritional value. The methods in which these foods are cooked also has a strong impact on their ability to retain their nutritional value; foods that are fried or baked have been found to lose their nutrients especially quickly. The development of a strain of intestinal fungus known as candida which has been known to cause frequent stomach upset has been associated with overcooked foods. This is caused by insufficiently digested food particles lingering in the intestinal tract. The resulting gastrointestinal irritation has also been a proven contributor to heartburn and food allergies. The key to avoiding these common ailments, according to many health experts, is to steer clear of overcooked and over processed foods as often as possible, and to consume plenty of green vegetables either raw or lightly steamed, in order to retain all of their essential vitamins. Nutritionists also advise that fried, barbecued, or pasteurized foods should be limited to as much as possible, and to pay close attention to the time taken to cook all of your foods, particularly meat products.